The purchase process each person takes is called the buyer’s journey. Each buyer advances through a research and decision process ultimately culminating in a purchase. When you hear the words “The Buyer’s Journey,” it may conjure up images of Tolkien’s rather boring (and non-existent) fourth Lord of the Rings book. In fact, it’s the increasingly important framework you’ll use to outline your marketing strategy and—if done right—dramatically improve sales. Buyers typically start with something they need and eventually make a purchase decision that aligns with or solves that need. If you aren’t already, you want to be paying close attention to everything that takes place before the purchase intent. Do you know how to build a marketing strategy that nurtures your strangers toward becoming buyers? If not, don’t fret. I’ve got you covered. I’ll be taking you through exactly what to do from start to finish. So let’s get going. 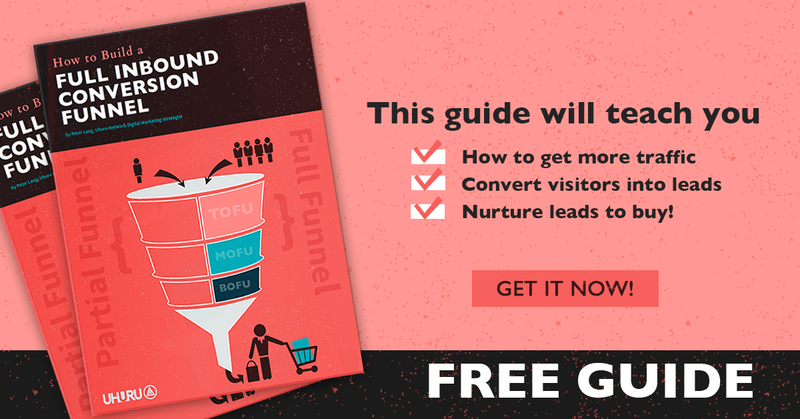 PRO TIP: Once you have an understanding of the Buyer’s Journey, make sure to get our step-by-step guide: Building an Inbound Sales Funnel That Converts. In a nutshell, it’s everything that someone would need to do before deciding whether or not to purchase from you. Are you starting to see why it’s so important? The vast majority of your customers are finding the information they need to make their purchase decision on their own. These customers will have made up their minds long before they ever reach out to you. You meet them where they’re finding their information. Make it so you’re the one providing them with everything they need to make the right decision. Supply them with valuable content that helps in their decision process and you’ll be gently nudging them closer and closer to buying from you. Why does the buyer’s journey matter? The answer is simple. By providing value and answers at every stage, you’re able to nurture customers toward making a decision and, if done right, the decision to buy from you. You’ll avoid the mistakes of more traditional approaches, like waiting until they’re ready or delivering a hard sales pitch. Supplying a lead with your expert guidance rather than making an attempt to force their hand will build trust. We all know trust has a tremendous influence on today’s purchaser and nurturing a lead according to a position on the buyer’s journey gives you the highest potential to convert them. By now you can see the importance of understanding the buyer’s journey. It’s time we break it down. Below I’ll show you exactly what each stage looks like and what type of actions you’ll want to take in order to help your lead move from one to the next. This way you’ll understand just how to engage your customers in order to help them reach the decision stage and a sale. In order to help paint a better picture I’ll be writing from the point of view of Mary, a marketing director for a company that sells all-natural sports supplements. We’ll walk through the buyer’s journey for one of Mary’s new leads. We’ll call him George. TOFU isn’t just on the menu at your favorite Japanese restaurant. TOFU also stands for top of the funnel, as in the initial stage of the buyer’s journey where a lead is eager for knowledge but least prone to buy. In this stage George is looking to meet a need or resolve an issue. In particular, he’s looking for a way to speed his recovery after his workouts. He’ll need to be educated and will be searching for information that will help him do so. That’s where Mary needs to step in to nurture her lead and help move him in the right direction. Her company sells the perfect branch chain amino acids (BCAAs) supplement that will help solve George’s problem. Now she needs to put information about her product line in front of him. Rather than advertising with pushy ads, Mary will need to take a different approach. It’s time for Mary to start creating high-quality, informative content that solves George’s problem and answers his questions. How exactly can she do that? Creating informative blog articles is a great way. She may write an article about the “5 Most Effective Ways to Enhance Workout Recovery.” George may not yet know about BCAAs but Mary would want to include them in her list along with things like proper diet, getting adequate rest, and drinking enough water. She’s not writing to boast about the benefits of her product. At this stage, it’s about the soft suggestion of a solution to a problem, rather than touting how a particular product or service can help your lead. TOFU content should educate, entertain, or inspire. Anything more may be off-putting and jeopardize the trust necessary to move them to the MOFU (middle of the funnel) stage. Mary will be sure to include plenty of helpful information, making her article a resource that others in the fitness community want to read and share. After all, her content isn’t just for George’s benefit. I want to share a quick statistic that reinforces just how important blogging is to influencing the buyer’s journey. Research by HubSpot indicates that companies that blog generate 55% more web traffic than companies that don’t. To reinforce the efficacy of her TOFU content marketing, Mary includes CTAs in her post that lead to a helpful tip sheet about the top 5 most important supplements for weightlifters, as well as an ebook on her website about the way different supplements are used to enhance the human body. Acquire new visitors – Her company’s stability and growth are dependent on her reaching new people. In today’s marketplace, she has her work cut out for her just getting people to know that her company exists, let alone take interest. Segment new visitors – By point of origin (how they got to her), as well as any other demographic information she was able to acquire upon their visit. Mary knows how important it is to gather information on her clients in order to optimize the strategy she uses to reach them. Company branding initiatives – Improve her brand’s visibility and steer brand perception in a favorable direction. Customers are building brands today as much as the brands themselves. Now let’s talk about your business. In the middle of the funnel, or MOFU, George has discovered that BCAAs will help his recovery times. He knows he wants to purchase a BCAA supplement and will begin to seek out suppliers/providers that will help him reach his ultimate goal. Mary has put her product in front of George and now he’s aware of her company. However, he’s also aware of the vast array of similar products on the market and is faced with the task of deciding which provides him with the best solution to his problem. During this stage, George is fairly confident that he wants to try taking BCAAs. Now it’s time to learn about them so he can make an informed decision and decide on the right one for his needs. He’ll be learning about what makes for a good BCAA supplement and what he needs to avoid. He’ll also need to compare the benefits of natural products vs. synthetics, his recommended dosage, the value of Mary’s product vs. others, and so on. Mary has been busy and has created more technical blog articles. These blog articles point to a BCAA supplement comparison video where her product goes up against its toughest competitors. The information George is able to gather from Mary’s content has brought him much closer to making a decision and being ready to buy. Build relationships – This will drive visitors back to your site. Capture Emails – This converts visitors into leads. Build social media channels – This will nurture prospects and buyers. By the time George has reached the bottom of the funnel he is very close to making a decision. He knows what to look for when choosing a BCAA supplement and has a list of favorites to choose from. In the decision stage, he compares reviews on each product and determines value based on price versus quality (results). Time for Mary to start up her content production engine yet again. This time she generates a case study of how her BCAA supplement was proven to be more bioavailable and thus generated an average of 14% faster recovery time. She shares this along with her expert review video from a professional natural bodybuilder. George weighs the pros and cons of each product. He cares about quality, he appreciates the expert’s opinion, and the fact that Mary’s product has positive peers reviews (from people like you and me) as well. Everything Mary has done to get George to this point helps him to trust her product and her brand, and he decides to purchase Mary’s supplement. Maximize funnel conversions – You’ve been filling your funnel, don’t let your leads stop moving through it. Take advantage of each lead that’s made it this far and convert as many as possible. Converting leads into customers – The goal of everything you’ve been doing up to this point is to convert leads. You’ve worked hard to earn their trust and make the sale. Maximize initial conversion value – Once again, you’re making the most of your hard work. Can the purchase your lead is about to make be upgraded? How can you make the most of their decision to buy? Now that you’ve closed the deal, you can wipe the sweat from your brow. However, your job is far from over. It’s time to maximize the value you provide your customers. Keep interacting with them and show them new and exciting ways to use your products. Mary might create a video about how to make the most of combining her company’s BCAA supplement with the perfect diet to supercharge George’s recovery time and make the most of his workouts. You want your customers coming back. The fact that they’ve already bought from you means that they’re far more likely to do it again. Other than useful and entertaining articles and emails Mary might send George discount codes for a future purchase or invite him to try samples of their other products at a highly discounted rate. The key is to keep your brand fresh in the minds of your customers by providing value. You could create an online community around your social media where your customers can interact with each other or give feedback on new products. Turn Customers into repeat customers – You have other products or services to sell, right? Do everything in your power to make an existing customer into a repeat customer. It’s far easier than trying to close a new lead. Maximize customer value – Your existing customers should be treated like the gold mine that they are. Offer discounts and special offers to existing customers and show them how important they are to your business. Reduce customer churn – You worked hard to make that sale. Do your best to keep customers from falling off the face of the planet after a single interaction. Company branding initiatives – Always be working to improve the way your brand is viewed by your customers and potential customers. Now that you’ve made the sale, get them sharing their opinions on social media or leaving reviews that help influence future leads. CLV (Customer Lifetime Value) – In marketing, customer lifetime value (CLV) (or often CLTV), lifetime customer value (LCV), or lifetime value (LTV) is a prediction of the net profit attributed to the entire future relationship with a customer. That’s it, the buyer’s journey from start to finish. Now that you’re ready to start creating content for each stage of the buyer’s journey, be sure to read our article – “The Buyer’s Journey Stages: Types of Content to Create for Each“. As you may have guessed from the title, it outlines the different types of content you should test creating for each stage in order to reach your buyers most effectively. I’d love to hear about your buyer’s experience with your company, so if you have any questions please comment below. Now go make the most of your leads and take advantage of your newfound knowledge.